A year ago, I launched my biweekly book review column, The Write Stuff, in Tempo. Since then, I estimate I’ve read and wrote about more than 52 books for my column — a couple of weeks I reviewed three books instead of the usual two. If you throw in the books that I’ve read for my own pleasure or education, plus working on my own writing, that’s a heckuva lot words. First off, I want to reiterate that I’m a book reviewer rather than a critic. I let readers know what’s in a book, so they can decide if it’s something they want to buy. I do make suggestions at times to the author and will offer points for improvement. But an outright bashing? It’s not good for my soul. Besides, for the authors, especially those who have published their books themselves, this is likely a labor of love. The sources for the books I’ve reviewed have run the gamut from self-publishing authors to publishing houses of all sizes including university presses. Novels are in the majority. The rest are non-fiction, including some fabulous art and photography books. I’ve even tackled a few volumes of poetry. Here’s my system. I read each book cover to cover usually in 50-page increments. Along the way, I use thin sticky paper to mark pages that might be useful to revisit or has a quote worth repeating in my column. I write the review for the first book soon after I am done reading. I’ve done it enough times that it pretty much flows onto the screen. I use far more playful language than I ever would for a feature or news story. Then, I read the second book, rinse and repeat. I clean up the column, cutting words to reach my limit, plus come up with a headline. I work way ahead of my deadline to make things easier for Tempo Editor, Rick Romancito, and myself. Sometimes a book’s review has coincided nicely with a reading by the author. Have I read every book submitted for a review? No. There have been a few that I just couldn’t get past the first several pages. They were badly in need of a good editor or were of a genre, deep sci-fi, I couldn’t get my head around. I just received a book that is nearly 700 pages long I doubt I will have the time to read. One bonus has been the books that were submitted. (I only review hard copies and not eBooks.) Most I have given away to people I know would love them or to the school for adult learners where I teach part-time. A few I’ve kept. Do I have any favorites? Without naming names, I am grateful to those authors who made me think, laugh, and admire their way with words. I was glad to spread the word. And if you read them, I’d be grateful for a review. 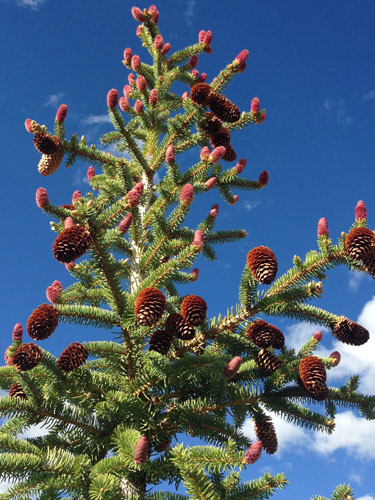 ABOUT THE PHOTO ABOVE: Pine cones bud on this evergreen on a neighbor’s land. As I often tell would be authors, there’s writing and then there’s the business of writing. When I began writing novels in earnest 17 years ago, I had one model in mind: I get an agent, the agent gets me a contract with a publishing house, my book is a hit. As for that model, I made it to the first step twice and almost to the second. Yes, I expended a lot of energy trying that route and querying indie presses. Ah, but the industry has changed with eBooks and the ability to self-publish successfully. So for the past year I’ve been doing it myself with the encouragement of a fellow author who’s been successful at it. I’ll say up front self-publishing is a lot of work. And the big lesson I learned from the first novel is that I need help marketing the second. Here’s what I’ve done in the past year. I published in paperback the first of a bilingual series for young readers, The Cousins and the Magic Fish/Los Primos y el Pez Mágico, with a translation by another author friend Teresa Dovalpage. It’s a bit of magical realism with characters one might find in Northern New Mexico where we live. Next came Peace, Love, and You Know What, a fun romp inspired by my own experiences in college, in eBook and paperback. Did I make any money on Peace, Love, and You Know What? In terms of what I dished out, I would say I broke even. Of course, I’m ignoring the reams of paper and printer ink, plus the countless hours I spent writing and rewriting the novel. Admittedly, the writing and rewriting bring me such great pleasure, so I am still ahead. I just released The Sweet Spot, the first of my hilltown novels. (I’ve included the synopsis below.) For the paperback, I opted this time for a matte cover, paid for an image I felt represents the novel’s contents, and chose a slightly bigger font. As I’ve posted before, I read and reread that novel countless times as my own editor. Of course, my designer worked her magic. It’s a pretty book for those who like paper in their hand or on their screen. I followed suggestions of having a great cover and posting social media leading up to the launch and after. The blog posts on my website featured characters and themes with excerpts from the novel. I scheduled a reading in Taos, where I live, for later this month. Copies of my novel are in the local stores. So how’s the business of writing going? I’d say on the modest side. But this time, I don’t plan on being so stubborn about it. Upon the recommendation of yet another author friend, I have turned to BooksGoSocial, to get the word out. This outfit, based in Ireland but with an office in the U.S., aims to gives an author’s book a much broader reach via social media than certainly I could ever muster at what I believe is a reasonable price. (My attempts at Kindle and Facebook ads were flops.) It also offers training in marketing via social media. The BooksGoSocial promotion for my novel The Sweet Spot started March 10. They will be tweeting the heck out of it and giving advice on what I can do. I will let you know how it works out. My mission: more readers and income from my writing. By the way, I am giving a presentation on publishing options at the inaugural Taos Writers Conference by SOMOS, the next day, March 11. I will be glad to pass on the lessons I’ve learned. Edie St. Claire is smack in the middle of what’s going on in Conwell: her in-law’s general store, the Do-Si-Do Bar, and this small town’s biggest scandal in years. Her father is a crusty so-and-so who runs the town dump. Her wisecracking aunt is as fiery as her dyed red hair. Both live next to Edie and her young daughter. Edie is a woman on the go, pretty and direct, but she holds onto an old sadness: the death of her husband in Vietnam. She tries easing her grief with his married brother, Walker. But when the affair comes to a tragic end, Edie does her best to survive the blame with the help of her rough-sawn family and a badly scarred man who’s arrived for his fresh start. Here is my book review column, The Write Stuff, which appeared in the June 9 fiber edition of Tempo, the arts and entertainment section of The Taos News. Every two weeks I review books that have a connection to New Mexico. This column takes on recent releases that reflect on two lives: one is a collection of autobiographical stories written by a beloved local doctor; the other is a noted author’s account of a boy growing up in New Mexico. Memoirs can be a tricky genre. A no-holds-barred telling may be satisfying for the author, but unfair to those who appear in the book. Others may not have such an interesting life after all. But that’s not the case with the late Dr. Larry Schreiber, who tempers his observations with humor and kindness as he shares stories from his life, which includes over 40 years as a physician and humanitarian. After interning in Albuquerque, Schreiber remains in New Mexico to work in medically under-served areas, where patients are so poor, they barter for care. He writes about finding love with his second wife, poet Cathy Strisik. We also learn how he deals with the effects of Parkinson’s disease, likely caused by his exposure to pesticides while working in a hospital in Cambodia. His writer’s voice is likable. I imagine a twinkle in his eye as he recalls his experiences and the people he knew. There is humor — one story about what an elderly patient in a hospital calls him made me laugh out loud. Then, there is sorrow — his grief over the loss of one of his sons. But such is the case, indeed, in a life well worn. Of course, with Schreiber’s death Jan. 18 the book is a bittersweet reminder of his profound value here and elsewhere. He died as he wished, at his San Cristobal home with his family beside him and a view of Lobo Peak through the picture window. The book was completed shortly before his death. “A Life Well Worn,” published by Nighthawk Press, is available in paperback. Schreiber’s children will read from their father’s memoir at an event Saturday (June 11), 6-8 p.m. at the Harwood Museum. Strisik will introduce the evening, which will include a video of Schreiber reading one of his pieces. Anaya chooses the format of the anonymous letter writer, presumably an old man, who tells Alfonso’s story to a person identified as “K.” The curandera’s prophecy comes true via an accident involving a train that leaves the boy handicapped. Later, he attends a university and emerges as a writer. As Alfonso grows and changes, so does New Mexico. Fans of Anaya and his writing style will undoubtedly enjoy this book. For others, reading “The Sorrows of Young Alfonso” may seem like dancing a slow waltz and wondering when the song will end. However, be prepared for a delightful dip toward the end. “The Sorrows of Young Alfonso,” published by University of Oklahoma Press, is available in hard cover.